"E l e m e n t s"
I hopped the metro to the opening reception this past Thursday to see the exhibit in the new space organized by Zenith Gallery at 1111 Pennsylvania Avenue. It's a wonderful corporate lobby which shows sculpture exceptionally well. The artists exhibiting in this second show are Alan Binstock, Ellen Sinel and Paul Martin Wolff. 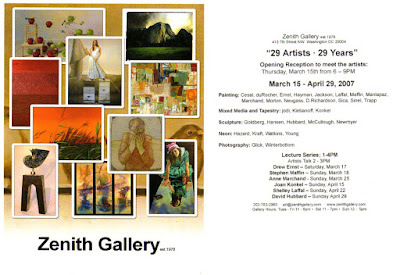 Reception; Thursday, March 29th 5 - 8 pm. Go visit this exhibit on your lunch break. Alan Binstock's glass and steel sculpture's are magnificent plays with light and his steel and stone pieces are tributes to self reflection. His studies in Yoga inform his sculptures and challenges his aesthetic directions. Washington Artist Ellen Sinel shows moving images of nature. Blades of grass contrast with nature's vast spaces and call attention to themes of growth, movement and spirit. Lawyer turned sculptor, Paul Martin Wolff thinks of his art as a way of connecting with God’s creativity. His effort to create art is "deeply contemplative and spiritual.” Here's some early on opening shots. Enjoy! Barbara Probst’s work investigates the many ambiguities inherent to the photographic image. By use of a multiple-release trigger system Probst abandons the single-eye gaze of the camera; presenting pieces, composed of multiple photographs, viewed from different angles and distances all shot at the same moment. Probst’s photographs causes us to consider directly the act of looking, by comparing and contrasting, we attempt to piece together the mysteries surrounding the images. We are provided with certain amounts of information and missing others. Probst however, plans this with precision and consideration, urging the viewer to become aware of fleeting moments and the frailty of a captured image. Despite the simultaneous shutter and common location, the images differ in style, atmosphere, and content. There is no overall aesthetic to tie them together, instead the photographs are bound by the one and only moment of exposure. 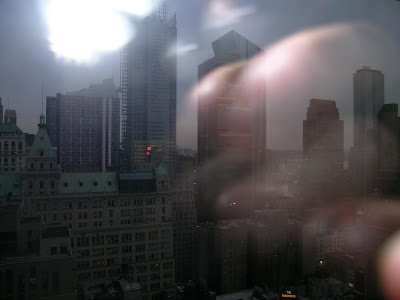 Thus forcing the viewer to confront their inclination to believe in photographic truth and exposing the photograph’s ability to mask, imply and affect. Probst’s art is a performance of the moment, the collection of images, and the disruption of the scene. The word exposure can describe her subjects under the scrutiny of the camera, the unveiling nature of her photographic process, or simply the act of taking a picture, opening a shutter to let light in. Barbara Probst was recently featured in Photography Now at the Museum of Modern Art. She is currently the subject of a survey exhibition at the Museum of Contemporary Photography at Columbia College Chicago. The Museum is co-publishing Barbara Probst; Exposures with Steidel, due to be released next month. LOS ANGELES, CA. - Richard Rogers, whose firm Richard Rogers Partnership is headquartered in London, has been chosen as the 2007 Laureate of the Pritzker Architecture Prize. The formal ceremony for what has come to be known throughout the world as architecture’s highest honor will be held on June 4 in London. At that time, a $100,000 grant and a bronze medallion will be bestowed on the 73-year old architect at The Banqueting House, designed in 1619 by Inigo Jones. In announcing the jury’s choice, Thomas J. Pritzker, president of The Hyatt Foundation, quoted from the jury citation, “Born in Florence, Italy, and trained as an architect in London, at the Architectural Association, and later, in the United States at Yale University, Rogers has an outlook as urbane and expansive as his upbringing". "From the very beginning of his stewardship of the Smithsonian Institution, Lawrence Small proved that he was inept at the delicate art of raising private money for a public institution. Mr. Small, who resigned last weekend, was hired to operate the Smithsonian in a businesslike manner, in keeping with his nonscientific background as an executive at Citibank and Fannie Mae." Todays New York Times Editorial read here. Mary D. Ott's exhibit at Touchstone Gallery, "Prints of Old Europe," shows another dimension of her work. Traveling with a digital camera in hand, Ott captured images that she has made into original, hand-pulled prints. Although the images are modern, her screen prints evoke a sense of history. Impressions of Crete are shown in overlays of colors and designs. Sunflowers from Slovenia glow in screen prints that incorporate oil paint and wax. Intaglios* present architectural details from the Czech Republic, France, Germany and Italy. ** Intaglio refers to printmaking techniques in which an image is incised into the surface of a printing plate. The plate is then inked and the excess ink is carefully wiped from the plate. Finally the image is printed onto dampened paper using a printing press. Multiple copies may be made, each one inked and printed separately. Ott uses a technique called "polymer intaglio" in which a photopolymer film is affixed to a copper printing plate. The image, contained on a transparency, is then transferred to the photopolymer film using ultraviolet light. The resulting photopolymer surface holds the ink and is wiped and printed like other intaglio plates, yielding a printed version of the image. What a gorgeous day today! The sunshine and warmth was a welcome guest. I spent a pleasant four hours greeting visitors during the afternoon at the "29 Artists - 29 Years", 29th Anniversary Exhibition Lecture Series at the Zenith Gallery. The gallery team put on a display of additional paintings of mine during the artists talk. 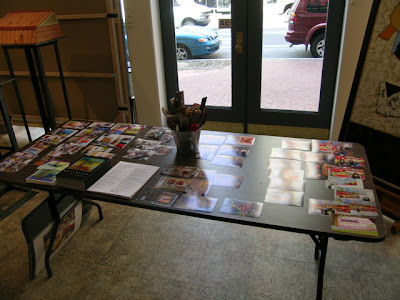 Fellow blogger, Sharon Burton of Authentic Art DC graced the Zenith Gallery premises in downtown Washington, DC for an hour. Sharon graciously talked with me about art, life and creativity. During our "painting-side chat" we were able to discuss the journey that we each experience as artists. Some of the creative territory that we covered were common themes of travel, the Desert Southwest in New Mexico, pictorial space, abstraction in painting, the architectural splendor of Washington, DC, how artists incubate in DC vs. New York City, acrylic processes and meaning in art; a lot to cover in one hour. After today's conversation, I would love to record future guests on a digital recorder that can download voice to text to a Macintosh G5 computer. Any recommendations? Here are some pictures from today's Lecture Series. Enjoy. Artist Anne Marchand (R) with Guest, Sharon Burton (L) of Authentic Art DC. Sharon Burton with my cityscape painting, "17th Street Mansion," and abstract painting,"Blue Ground" available thru Zenith Gallery. 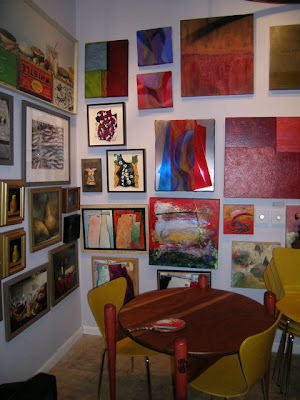 Visit Sharon Burton's blog, Authentic Art DC often. Visitors at "29 Artists - 29 Years", 29th Anniversary Exhibition Lecture Series. Simply Garbage? Rubbish! It's Found Treasure. "5 + 5: Five Artists Select Five Artists to Watch," an exhibition at the center's Ann Loeb Bronfman Gallery celebrating, for the first time, neither Jewish themes nor Jewish artists but connections, in the broadest sense of the word, to and among the local community." Read here. This nation in this century has pulled thousands of artists from the museums, galleries and universities and plunked their work onto the street corners. Common objects and icons -- fiberglass replicas of corn, for instance -- got an artistic makeover and became the curiosities of townies and tourists across the nation. On Tuesday this week, 40 members of Welcome to Washington Group boarded a bus to see the work of local artists in recognition of Woman's History Month. The group toured my Westminster mural at 913 Westminster St. NW in Shaw, applauding as the bus rounded the tight corner at 9th and Westminster Street NW. They could see the brightly painted 35' mural in the playground immediately as they turned left onto Westminster Street. The "Community" mural is in a little gem of a pocket park in the Shaw neighborhood and has been warmly embraced by the neighborhood residents since 2002. This is the first "official" art tour, that I am aware, making its way over to the playground mural. 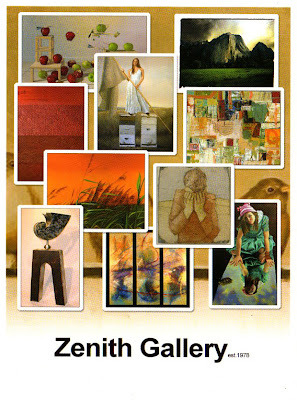 Afterwards, the tour came downtown to the Zenith Gallery to meet me and see my abstract work and cityscape paintings. As they poured off the bus, I wondered at the changes taking place in the DC artscene. I've been watching the art scene evolve in DC since 1978, yep a long time, and I'm happy to report a much happier art environment in the city. It's wonderful to have groups interested in meeting DC's "living" artists. Owner Margery Goldberg, was on hand to point out the works of other artists in the current exhibition at Zenith Gallery, "29 Artists - 29 Years" / 29th Anniversary Exhibition. Thanks to the National Museum of Woman in the Arts for recommending the tour. My triptych "Beginnings" next to a Sue Klebenoff tapestry and Margery Goldberg table. Director Julie Reese "taking care of business". WHY: Enter SiteProjectsDC to have your installations, sculptures, paintings, projections, etc. shown along the 14th street corridor! Sites range from storefronts, to building facades, to fenced-in sidewalk spaces. WHAT: SiteProjectsDC is a public art project designed to engage local artists in the creation of public art installations along the 14th Street Corridor. Curated by Welmoed Laanstra, this project invites artists to create site specific, temporary, two or three dimensional art installations. In addition to painting and sculpture, new media, performance art, and installations that would be on view for a shorter amount of time are encouraged. STIPEND: A $250 stipend will be given to all finalists to assist with the cost of supplies and materials. LOCATION: 14th Street Corridor between P & V Streets, NW. Specific locations will be announced & discussed during the Informational Workshops with the Curator (Info below). If applying with already completed work, it must have been created between 2005 – 2007. If applying with a new proposal and selected, artists will be encouraged to work directly with the location owner to develop a site specific installation or piece that considers the particular locale’s architecture or layout. SiteProjectsDCis open to all artists over 18 who live in Maryland, Virginia, or the District of Columbia. for additional information on any upcoming or current WPA\C exhibitions & programs. SiteProjectsDC is funded in part by the DC Commission on the Arts & Humanities, an agency supported in part by the National Endowment for the Arts. Join us for a panel discussion with artists featured in the current exhibition 5+5: Five Artists Select Five Artists to Watch. The program is free and open to the public. The artists will talk about their work and answer questions. The participants are artists Pia Calderon, Mary Early, Jae Ko, John Gossage, Dan Steinhilber and Renée Stout. Anne Ellegood, associate curator at the Hirshhorn Museum and Sculpture Garden, will moderate. On Saturday March 24th, Project 4 invites all to participate in a work-in-progess. Reuben Breslar will be hosting an event that provides the unique opportunity to sit, draw, and talk with strangers and friends. This "happening", as Breslar calls it, is "centered around the individual while upholding community awareness." Occurring concurrently with the "Specimen" exhibition, this happening will turn guests into specimens themselves, observers of the phenomenon, and those who interchange between. All this is done with the intention of bringing people together for an arts event centered around the most fundamental building block of art: drawing. Drinks, colored pencils, and paper will be provided but feel free to bring your' own drawing materials and sketchbook. Tha Corcoran is offering up its much anticipated blockbuster exhibition, Modernism Designing a New World 1914—1939. This ground-breaking and vast exhibition explores the foundation and meaning of Modernist art and design and its evolution into a mass movement that continues to impact the way we live. "Never before have the conditions of life changed so swiftly and enormously as they have… in the last fifty years. We have been carried along… [and] we are only now beginning to realize the force and strength of the storm of change that has come upon us." Project 4 is proud to present “Specimen”, a group exhibition of ten internationally selected artists whose bodies of work explore themes of preservation, evolution and documentation. A specimen can take on many forms and explanations. Culturally, they are used to categorize and compare an archetypal ideal. Biologically, a specimen is an individual taken used to exemplify an entire mass for analysis. Historically, specimens are used to reference change, evolution and experience. The artists selected for this exhibition explore these concepts through the common process of investigation. Artists make use of documentation in their processes, whether used literally, of a change in a particular artistic medium, photographically, of humans as studies of civilization, or abstractly through subtle changes within each piece. Viewers are allowed to interpret and create the reality they are led to by each of the resulting groups of works. Local artist, cartographer and activist Nicolas Schiller's unique maps are the subject of David Montgomery's excellent article. "Through Nikolas Schiller's Eye, Aerial Maps of Familiar Places Become Terra Incognita." A Breath of Fresh Art / Graham Caldwell, Blowing Hot and Cool By Blake Gopnik. Express contributor, Kriston Capps surveys the local arts scene. 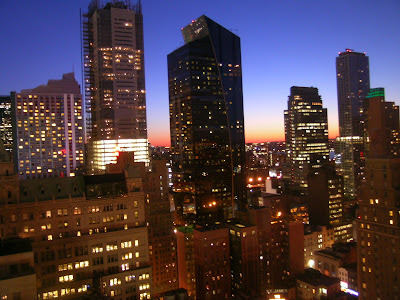 Ever wonder at the Megalopolis of New York City and how it got that way? Read the excellent article by Philip Kennicott in the Washington Post about the rise of the Big Apple. Washington, DC - Just in time for the busy tourist season, DC's newest Internet startup company, mobiletours.org, launches today with a free tour of the Capitol's major sites for mobile phones. The service has eleven separate numbers to call, each of which corresponds to a famous building or memorial. The company plans on rolling out a marketing campaign that consists of handing out flyers to tourists and educating the tourism industry about the service. Founder of the company, Richard Zielinski says, "We are using the latest IP phone technology, based on the Asterisk® open source PBX, to bring our podcasts into people's mobile phones. Its cutting edge stuff, but the service is very user friendly. Anyone who can dial a phone number will be able to access the tour." The tours consist of short two minute histories of the site followed by a story or audio file. At the Lincoln Memorial for example, users will hear a rare audio interview from 1938 of an old man recalling what it was like, as a 9-year-old school boy, to watch Abraham Lincoln deliver his Gettysburg Address. At the Washington Monument the narrator reads an article from 1908 in which a Washington Senator baseball player catches a ball dropped from the top window to win a $500 bet. At the war memorials, listeners will hear interviews with Veterans. Says Zielinski, "We want the tour to be informative, but we also want it to be engaging. Visiting these national treasures can be a deeply personal experience; we want to help enrich that experience." While mobile phone tours are becoming popular, mobiletours.org is the first company to offer their services in a major city for free. Although not intended to replace a knowledgeable tour guide, mobiletours can be an excellent alternative that allows for both convenience and flexibility. The tour can also be freely downloaded off of the website for use in digital MP3 players. Mobiletours.org is planning on rolling out a New York City and Boston tour later this spring. 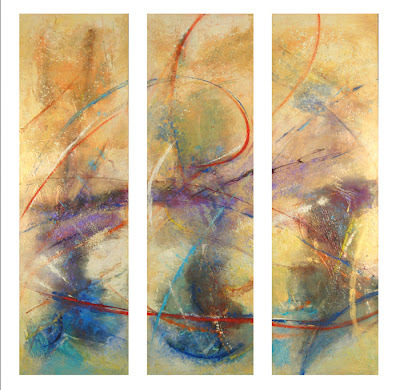 Anne Marchand, Beginnings, acrylic and mixed media on canvas, 3 panels - 18" x 60" ea. Both indoor and outdoor sculptures are a monument to movement & light. Rusted steel & stainless steel. "What Artists Need to Know about the Artist-Gallery Relationship" with Alyson B. Stanfield and special guest, Paul Dorrell . . .
Paul Dorrell is the author of the acclaimed guidebook for artists, Living the Artist’s Life. 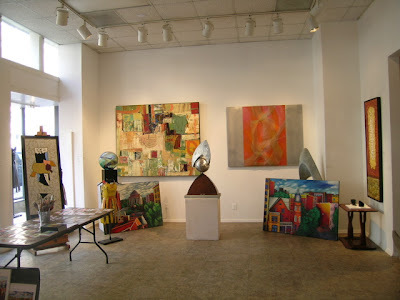 Paul founded Leopold Gallery, one of Kansas City's pemiere galleries, in 1991. He also has an active blog, Paul Dorrell's Blog, and is a columnist for The Artist’s Magazine. FRIDAY, March 9, 2007 - 6:30-8:30 p.m. The recipe for creating a contemporary art scene is not hard to intuit. Take some innovative, eager, personable young artists, add a few hip commercial galleries and artist-run spaces, some savvy collectors, at least one critic of enthusiasm and intelligence, a pinch of media outlets for such criticism, a nearby museum with a contemporary-art curator, and your choice of a welcoming restaurant, bar, or coffee shop where all these people can meet, and then mix well. Voila! Who needs New York? The reality is a bit more complicated. Plenty of cities have the minimum daily requirements for an art scene but don't quite pull it off - San Francisco, say, or Boston. That's because art is ultimately about something else: imagination, talent, risk taking, having something to say. In Washington, D.C., an art scene is taking shape today. That's as much testament to the imagination and risk taking of the people who choose to show contemporary art as of the artists who make it. Civilian Art Projects is a great example of a grass-rooted, arts-community based, independent minded showplace for art that complements the city's other innovative enterprises, from the late, lamented Fusebox to Transformer to the Hirshhorn Museum. The list could go on. Civilian Art Projects is the brainchild of Jayme McLellan, a co-founder of Transformer and a contemporary of many of the artists she now represents as a commercial galleryist. Her vision is sympathetic to a broad mix of media and styles, she believes in the importance of her generation of artists, and her timing is impeccable. With this, Civilian's first show, she gives us a glimpse of what these young artists have to say. Jason Falchook's color photographs depict unprepossessing, unpopulated urban spaces lit with the enervating glow of mercury vapor lights. They have the isolated eeriness of surveillance pictures, but the corrugated fences and shutters and stark buildings are their own protagonists. The time is night or nearly so, and without the intersession of the photograph we probably would not linger long to examine the scenes in detail. Falchook calls the series "Contours & Detours," but we might also add a coda, "Places We'd Just as Soon Avoid." Still, the bright light sources give off what passes for warmth, and one suspects that beyond the terror we are made to feel lies a sympathy for a present that seems equally to speak of the past and the future. Jason Zimmerman's series "Natural Acts" continues his photographic exploration of incidental evidence supplied by the physical world. Like Falchook, he positions nature and humanity in a tenuous balance, but while Falchook's pictures read as surveillance Zimmerman's appear forensic. Whatever the word "documentary" means when applied to the camera, it has traction here, in images of chipped china and gooey aluminum foil and other frayed objects, but for no imaginable uplifting social purpose. Call it Documentary Degree Zero, a collection of evidence for which there is no crime. Taken together, and in company with the other artists on the roster of Civilian Art Projects, Falchook and Zimmerman are sniffing out similar aesthetic territory, fashioning a discourse that tempers inevitability and loss with possibility and wonder. Without seeming cynical or hectoring, their work steers us toward considering art as a critical instrument that embraces feeling and subjectivity as crucial to its meaning. The debut of a new gallery that celebrates local talent is always a cause for celebration and optimism, in part because it signals the viability of a new aesthetic point of view. In this case, the cause for optimism is even greater since there is an assumption that this viewpoint has a market - that collectors and curators will support these artists and this gallery. Based on the evidence of this first show, they should. Andy Grundberg is a critic, curator, and educator who has written about photography for more than 25 years. His writings for the New York Times and other publications are collected in the book Crisis of the Real (Aperture). Founded in 2006, Civilian Art Projects is Washington, DC's newest gallery gnawing at the edges of contemporary aesthetic discourse. Through a challenging exhibition series supporting promising, up-and-coming artists working in a broad range of media, and through exciting events of cultural and social significance held throughout the season, Civilian will generate new energy, ideas and momentum thereby contributing to culture and community. For more information on the artists or the gallery please contact Civilian Art Projects at 202-607-3804 or info@civilianartprojects.com. Please visit the website at www.civilianartprojects.com. 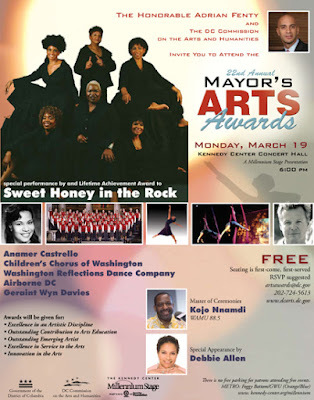 visit www.dcarts.dc.govto read the press release and see the listing of Award Finalists! Doors Open at 5:30pm. First Come, First Served. Marilou Donahue interviews TERRI AND BINDI IRWIN, Wife and Daughter of the late Steve Irwin “The Crocodile Hunter on her March website. 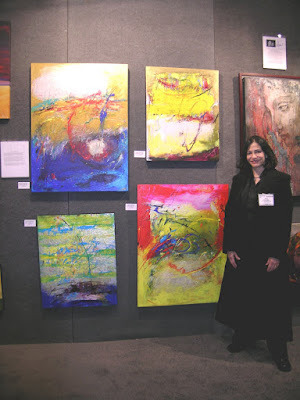 Her web site also features a good read on Career Tips for Collecting Fine Art by Judy Pomeranz. Enjoy! 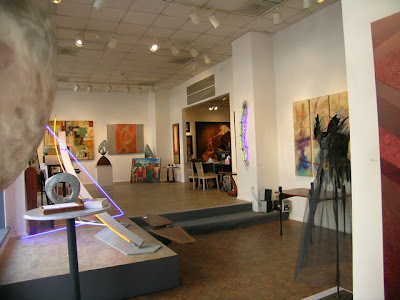 In tribute to the late William Warren Parker's support for emerging DC artists, his family has generously donated space at the William W. Parker (WWP) Gallery – housed in Mickelson's Fine Art Framing at 629 New York Ave NW - to WPA\C for a new “nine-by-ten” exhibition series: 9 shows of 10 member artists each . These shows will provide a new outlet for WPA\C member artists, and each exhibition will present a diverse cross-section of the WPA\C membership to the public, showcasing works in all media. 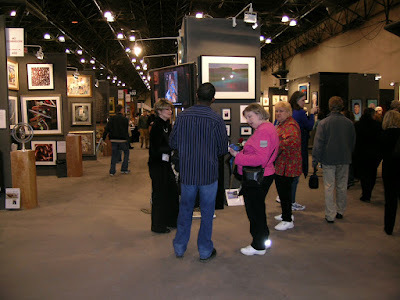 The 9x10 exhibitions will run monthly from March 2007 to January 2008. "...but what have we gained?" Blown and Silver Plated Glass, 18" x 18" x 6"
Widely considered to be a pioneer of mixed media sculpture in this region, Tim Tate continues to push the boundaries of contemporary sculpture by incorporating narrative and conceptual ideas with technique and craftsmanship. Veiled, an exhibition of paintings and mixed media works by Baltimore-based artist Erin Cluley, explores the nature of religion and its divergent symbols and rituals. Inspired by her up bringing in the Catholic Church, Cluley questions the religious values that shaped her existence, particularly the ritualistic practices of confession, penance, and the sacrament of the mass. Her richly layered constructions serve not only as a vehicle for introspection, but also as an investigation of the tension that lies between punishment and reward. Modernism: Designing a New World 1914-1939 is the largest and most comprehensive exhibition on the subject ever staged in America, and the Corcoran Gallery of Art will be the only American venue. The exhibition explores the foundation and meaning of Modernism, and it contains some of the most seminal works of modern art, graphic and product design, and architecture produced in the first half of the 20th century. It traces the historic development of modern form through social, industrial, and political upheavals of the 1920s and 1930s. It investigates the role of the factory and mass production; the spiritual aspect of modern life; the period’s fascination with the healthy body and organic forms found in nature; and national identity. BRICE MARDEN: A RETROSPECTIVE OF PAINTINGS AND DRAWINGS Through May 13. San Francisco Museum of Modern Art, 151 Third St., San Francisco. "Anyone who gets to see an exhibition in more than one venue quickly realizes what profound effects differences in installation can have. They can alter the impact and implication of individual works and blur or sharpen the visitor's sense of an artist's creative logic." To see a video of Brice Marden's walk through his exhibition at the San Francisco Museum of Modern Art, click here. E-mail Kenneth Baker at kennethbaker@ sfchronicle.com. Interesting report out of the University of Minnesota's Humphrey Institute of Public Affairs. The report by Ann Markusen tracks the rampant sector-hopping that constitutes the lives of most working artists. "Surprisingly large percentages of artists split their arts time among the three sectors. Overall, 39% spend most of their arts time (65% or more) in the commercial sector. Another 19% do no commercial work, and 42% engage part-time in commercial artwork. Smaller shares of artists spend most of their arts time in not-for-profit (public and nonprofit) sector work (29%), and 55% report working part-time in that sector. Only 6% devote most of their art time to the community sector, but 69% work in community arts at least some number of hours." - Andrew Taylor Read more here. After wandering the massive labryrinth of exhibitors at ArtExpo NY this weekend, we hopped the train home today energized by the hustle bustle of the Megalopolis of New York City. I love vegan restaurants and we found the "Sacred Chow" in Greenwich Village last night to be a dreamy relaxing oasis after the anthill effect of the day. Plus, being the vegan dessert scout dejour, I was happy with the selections...triple velvet brownie and sticky date bread pudding were awesome and there were LOTS more to choose from. Please DC, let's have some more veggie restaurants! A bonus.......coming to the Washington Convention Center on April 27-30, 2007 is artDC, an opportunity to see the DC art world in action and I DO MEAN ACTION. Get ready and put your favorite Art Fair shoes on. The Washington Convention Center is filled with a fabulous art collection of its own! And DC's top notch galleries are exhibiting with other prestigious international galleries. This is going to be a good one - not to be missed! WHO: A select group of 80 art galleries, plus curators, collectors and connoisseurs from the art world, representing the four corners of the globe. WHAT: artDC, the first modern and contemporary art fair in Washington, DC, will bring together international emerging and established galleries from Europe, Asia and the Americas. Galleries such as Galerie Marion Meyer from Paris, and Artcore/Fabrice Marcolini from Toronto, Red Star Gallery from Beijing and Shine Art Space from Shanghai as well as Sundaram Tagore Gallery and Westwood Gallery both from New York, Frey Norris Gallery from San Francisco, and Kunsthaus Santa Fe, San Miquel de Allende from Miami will join the strong showing of DC’s finest galleries that includes Conner Contemporary Art, Robert Brown Gallery, Douz & Mille, Curator’s Office and G Fine Art, and will establish artDC as one of the not-to-be-missed annual fairs. artDC will emphasize special sections within the fair, from the cutting edge SLICE, where visitors can discover the hottest trends in the art market; China Focus, a curated exhibition of contemporary artists from Shanghai; to galleries that are presented in the context of New Media, installations that are reserved for digital and video art; Project Spaces, featuring large-scale sculptures and installations; and our unique Video Lounge & Bar that will feature video projects by regional artists participating in a local juried competition organized by artDC and Flashpoint. artDC is designed to be an exciting platform for a broad spectrum of contemporary art, while also paying homage to the modern collections that are the pillar of so many local institutions and exhibitions. Friday is a free admission day. Saturday – Monday general admission is $12, $9 for groups of10 or more and $6 for seniors and students. 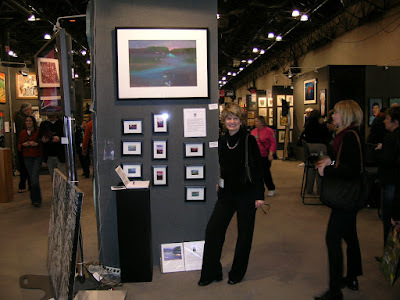 I met a lovely artist Linda Richichi at Art Expo New York for the first time. Linda is a Plein Air colorist and is showing small landscapes. She graciously consented to poise for my blog. You can see her work at www.lindarichichi.com. Photography is not encouraged inside the NY Art Expo for all the right reasons but here I am entering the massive show room floor. 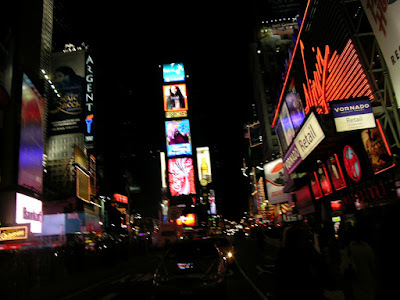 Our hotel is nearby at Times Square, America's Midway. Our favorite Zen Palate is just up the street so you can be sure I ordered the delicious chocolate raspberry cake for dessert. 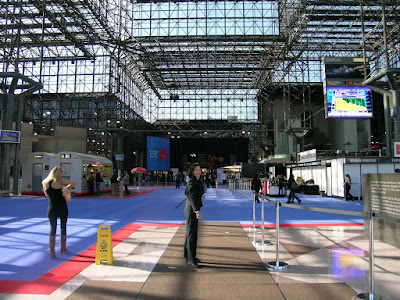 Drop by and visit my painting display at Art Expo in the Jacob Javits Center this weekend from March 1-5. Those are my abstract paintings on my right.